What is a bicycle system? and do you need one? I think COBI is confusing the word “enhance” or to make better with “distract” or to divert attention from what you are doing (riding a bike). observe real-time information like speed, time, distance and climb rate. a buddy radar, which all aid the rider to travel easily between their destinations. So… what does this thing that my iPhone does not already do? And why should I give them my money? This entry was posted in Crowdsourced, What could possibly go wrong? on December 11, 2014 by Gary. I agree that they need to find a better way to articulate what their product is and what it does, but from the video it doesn’t look insane. 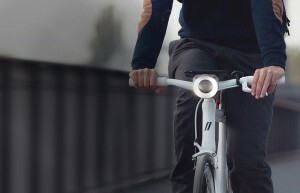 The Cobi integrates a head light, a tail light and turn indicators with an iPhone charger and a thumb controller. That last part looks valuable, as trying to control your phone with the touchscreen while riding is clearly dangerous. How much money do they want for this? I doubt I would buy it but it could be good for other sorts of riders.